The 2017 WNBA Playoffs are underway and, if last night’s first round of single-elimination games are any indication, it’s going to be a fiercely competitive road to the Finals. Last summer, the WNBA switched up its playoff seeding in order to create more intriguing matchups from top to bottom. The first eight teams with the best records and highest winning percentage, despite conference assignment, make the playoffs. 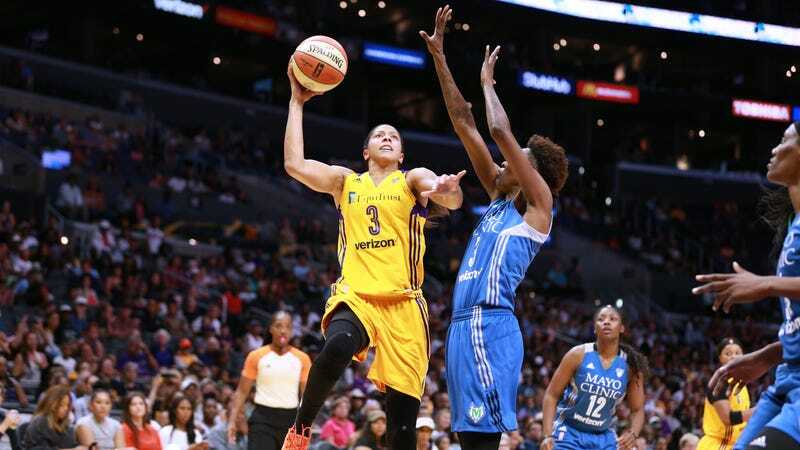 Other changes that took effect include an increase in playoff rounds from three to four, and the top two seeds—this year, the Minnesota Lynx and the Los Angeles Sparks—getting byes until the semifinals. The third and fourth seeds—the New York Liberty and the Connecticut Sun this year—each got a first-round bye. This year, the playoff picture wasn’t clear until the very last weekend of the regular season. The Liberty and the Sun ended up swapping seeds as the Sun lost a few key games down the stretch, and the Liberty went on a 10-game winning streak. The bottom four teams—Dallas Wings, Seattle Storm, Phoenix Mercury, and Washington Mystics—jockeyed for the last four spots, all hoping to gain some momentum heading into the playoffs. With Brittney Griner leading the league and her team in scoring with 21.9 points per game, the Mercury won their last three games of the season to finish on a high note. Other league leaders this season include the Sun’s Jonquel Jones, who set a single-season record in rebounding with 11.9 rebounds per game, and the Chicago Sky’s Courtney Vandersloot in assists with 8.1. The Storm’s Sue Bird set the WNBA’s all-time assist record this season when she tossed out her 2,600th dime of her career. She finished third this season with 6.6 assists per game. But let’s get back to the playoffs. Elena Delle Donne returned to All-Star form in the first single-elimination game between the Mystics and the Wings, scoring 25 points and nabbing 11 rebounds while leading the Mystics to a 86-76 playoff win. The Mercury then toppled the Storm in the second single-elimination game with a 79-69 win behind Griner’s second-half surge. Griner finished with a double-double on 23 points and 11 rebounds. The Mystics will face the Liberty in the first game of the second round at 3 p.m. on Sunday, while the Mercury take on the Sun later that same day at 5 p.m. Both matchups are also single-elimination games. Impatiently waiting in the wings for the semifinal round are the Lynx and the Sparks, who appear headed for a WNBA Finals rematch. With similar regular-season records—Lynx at 27-7, Sparks at 26-8—and rosters that are overflowing with veteran All-Star players, it will come down to who has the easier path to the Finals. The Sparks could face a fast-paced and young-and-hungry team in the Sun, or a Mercury team that found its stride over the past few games. Griner was out with an injury in July but seems back to form since returning to the court, nabbing her sixth 30-point game of the season with a closeout win against the Atlanta Dream. Both teams have the potential to give the reigning WNBA champs some trouble. As for the Lynx, when Lindsay Whalen broke her left hand earlier in the season, they were a different kind of team. Whalen is the motor that makes the Lynx’s engine run, and they clearly had a bit of trouble during her absence. At the start of the season, the Lynx were dominating the field. Without Whalen, they lost more games than they should have and almost lost the No. 1 seed as a result. The good news for the Lynx is that they’re getting Whalen back just in time for the playoffs and with byes in the first and second rounds, she should be good to go by the semifinals. It will be interesting to see how she plays after her injury, especially with a possible matchup against the streaking Liberty. Favor says that all signs point to Sparks-Lynx again this year, and it’s hard to disagree. The only way this sequel doesn’t happen is if another team—perhaps the Sun or the Liberty—decides to play spoiler. Lyndsey D’Arcangelo is a freelance writer from Buffalo, NY. A regular contributor to Deadspin and other national media sports sites, she remains a suffering Bills fan and a forever advocate of women’s sports. Why Aren&apos;t Women&apos;s Basketball Fans Following Their Players To The Pros?